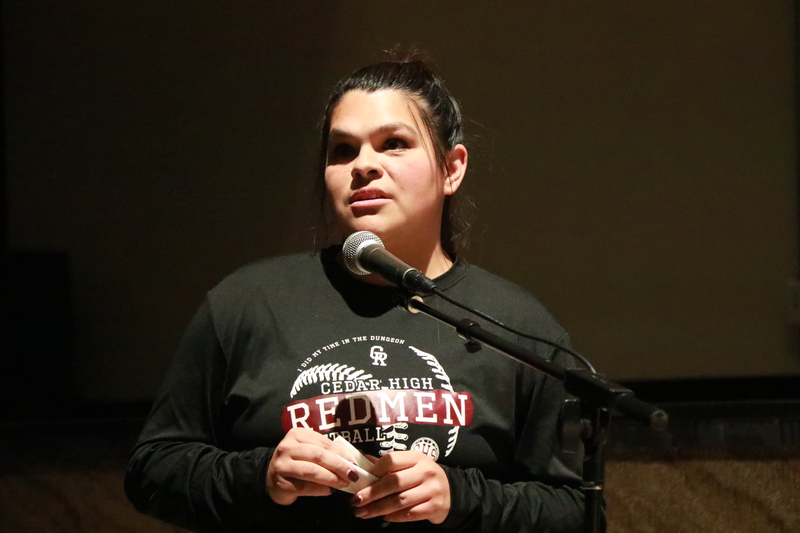 CEDAR CITY — A crowd of more than 200 people gathered Tuesday night in Cedar High School’s auditorium, with more than three dozen people publicly voicing their opinions on whether Cedar High’s “Redmen” mascot should be changed. The public hearing, which lasted more than 90 minutes, was the first of three planned public hearings on the issue, said Rich Nielsen, Iron County School District’s director of secondary education. The other two hearings will be on Dec. 18 at 7 p.m. and on Jan. 14 at 6 p.m. Originally, just the two December sessions were planned, but Nielsen said the third one was scheduled for a Monday night in January at the request of Cedar High students. The students were concerned some would be unable to make either of the first two meetings due to other school activities on the schedule, he told the audience. 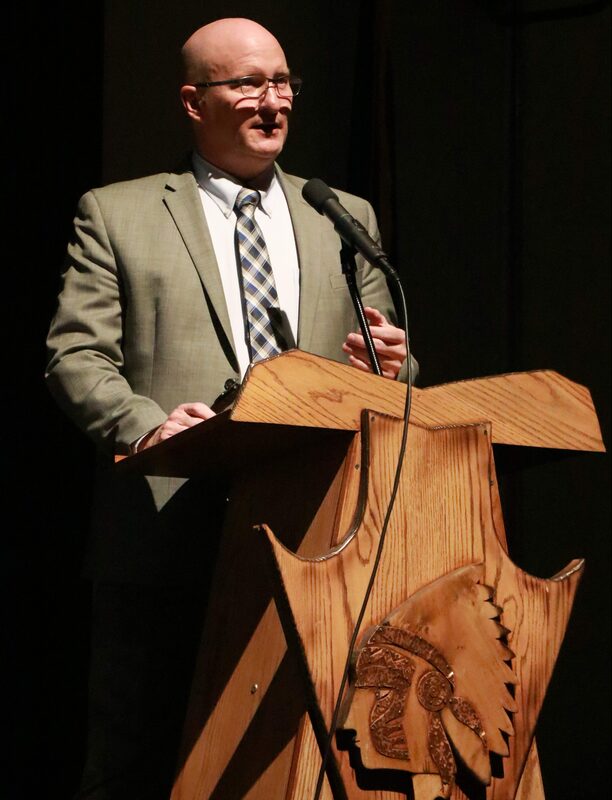 Following a welcome by CHS principal John Dodds, Nielsen gave a brief overview of the reasons behind the school board’s decision to create a 28-member committee to study the mascot issue. 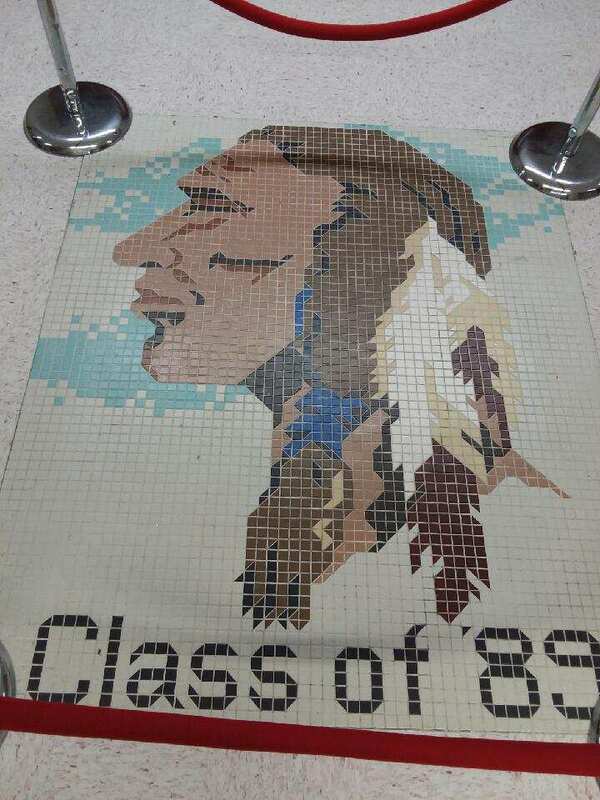 Included on the mascot committee are past, present and future CHS students, faculty and staff members, administrators, and Paiute tribal leaders, he said. Even before Tuesday’s meeting, Nielsen said the committee has already received numerous written responses from the public via email, using the dedicated address [email protected]. “It’s been a very good conversation,” Nielsen said, adding that there is no question about the passion that generations of CHS students have held for their beloved mascot since it was first instituted in 1942. However, Nielsen went on to say that since the term “redmen” is viewed as a racial slur by some people, its usage needs to be viewed through a “21st century lens,” recognizing the influence of social media. Before opening the meeting to the public comments, Nielsen also briefly addressed a few additional questions that have arisen, even though a few of them lie outside the scope of what the committee has been asked to do. Some athletic companies such as Adidas have grants available to assist schools making such changes, he said. As for the marquees and other signage, that would be up to the school board to decide how and when to implement changes, should they decide to do so. There are absolutely no plans to change the school colors from maroon and gold, Nielsen added. As for what the mascot would be if it’s not the Redmen, Nielsen said that is a topic for future consideration. “We’re not going down that road right now,” he said. Regarding the issue of tribal support, Nielsen said the local Paiute tribe has indicated its support for the current process, and even though tribal members’ views may differ on the issue, the group will support the board in its decision. That position was affirmed by Tamra Borchardt-Slayton, chairwoman of the Pauite Indian Tribe of Utah, who was the second person to speak during the public comment period. 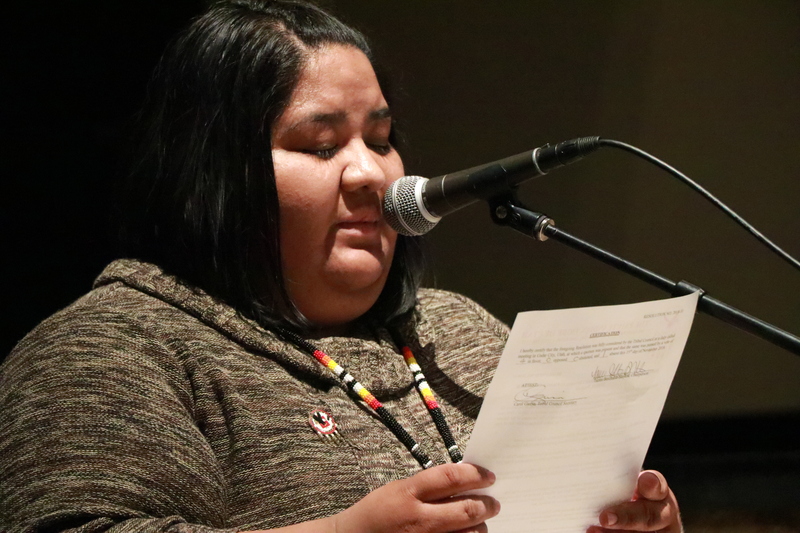 Borchardt-Slayton, who is also a member of the mascot committee, read aloud a resolution unanimously passed by the Paiute Tribal Council on Nov. 15. “The tribal council hereby supports the Iron County County School District in its efforts to carry out its mission by changing the mascot from Redmen to another mascot in order to create a better tomorrow for all students that attend Cedar High School,” she read. 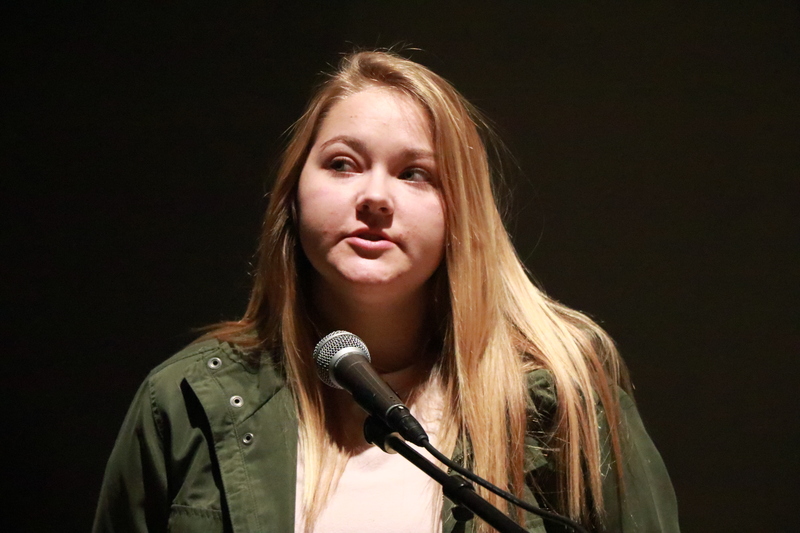 Afterward Borchardt-Slayton clarified that the school board has not yet made that decision, and the intent of the resolution was to affirm the tribe’s support for whatever the board decides to do. For the next hour and a half, people approached the microphone in succession, nearly all of them adhering to the three-minute time limit as they expressed their views. Their opinions were mixed, as were their demographics, which included Native Americans and Caucasians, both female and male, ranging in age from early teens to early 70s. Many had either attended or currently attend CHS. “How can you be proud of this? It’s offensive” said another Native American woman, who said the term “redmen” was a throwback to days when white bounty hunters would collect scalps of Native Americans. Other Native American speakers voiced their support of the mascot. One man, who graduated from CHS in 1966 and later served in the military, said he has always remained proud of his cultural identity. Taniah Sims Henrie, a 2007 graduate of CHS and a current assistant softball coach at the school, said she’s never viewed the mascot as being derogatory. “I’ve never been more proud to be a Redman,” she said, noting that she is a member of the local Paiute tribe. Another Native American woman said she raised her children to know what a mascot is and how it is chosen for its strengths and admirable qualities. Another Native American woman said she’d been called many derogatory names before, such as “savage.” She said she doesn’t mind the Redmen mascot and that it doesn’t matter to her whether it is changed. Several CHS students also chimed in. Several were in support of keeping the current mascot, while others want to see it changed. One student said taking away the mascot would just make the division worse, a sentiment echoed by another student who said he believes the mascot unifies the student body and helps them think more about Native Americans and their culture. Other adults also shared this belief. “Its a term that’s more used to mock,” she said, adding that she doesn’t belong to the Native American culture. “I don’t share that history. I can’t claim it,” she said. Allen said she’d prefer to see the school switch to an animal mascot, mentioning as an example the Falcons (which is used by cross-town rival Canyon View High School). “The mascot Falcons doesn’t hurt anybody but the Redman does,” she said. Multiple commenters said they don’t see the issue going away until the mascot is changed. “Why come back to it every few years? Why not do what’s right?” asked one woman who deemed the mascot as being “hurtful and offensive,” similar to displaying a Confederate flag. “We can change it now or spend another 10 years talking about it,” said another woman, who suggested switching to a non-offensive mascot. Another woman called it a “lose-lose” situation. “There’s no way to make everyone in this room happy,” she said. “And how far do you take it?” She raised the question of whether professional sports teams called the Giants would be seen as being offensive to small people. “I think the tribe should make the final call,” added another man. One CHS student named Spencer said the issue wasn’t as simple as just a mascot. As the meeting wound to a close, Nielsen invited anyone who didn’t have a chance to speak Tuesday night to attend either of the upcoming public hearings. Commenters were asked to just speak a total of one time to allow more people the chance to talk on the record. In the meantime, written comments and opinions may be sent via email to [email protected]. Following the Jan. 14 public hearing, members of the mascot committee will have a little over a week to assess their findings and prepare a presentation to be given to the school board at its regular meeting on Jan. 22. Change it to Cedar Whitemen. We’re not offended when our name is used in a positive way like representing strength, courage and inspiring young people to be their best on the field and in life. If Redmen don’t want to be honored for their bravery, strength and loyalty then I guess we shouldn’t want them to be our mascots or our inspiration to be better. I honestly can’t see how the Redman mascot is offensive. Mascots are meant to honor, not denigrate. No team chooses manure as their mascot. They choose things that symbolize positive values like strength, nobility, and honor. They also choose them for how they represent their heritage. I could understand it if the imagery or language was used to portray negatives about what the mascot represented, but I haven’t seen any of that with the Redman mascot. It is impossible to never offend anyone, because some people have an infinite capacity to be offended. I’d say we should grow thicker skin, but that may offend people who identify as a rhinoceros today. A room full of victims? Nope, a room full of people with differing views on the issue. Its not “being a victim” to highlight a term’s pejorative meaning. CHANGE IT!!!! I swear it’s like pulling teeth with white people to get you to understand the idea of mutual respect. You do understand that many local indigenous people SUPPORT the name right? Same with the Utah Utes. I’m not saying I do but it has nothing to do with “white people”. That is true yet as the article highlighted the tribal government supports a name change. Which, again, has nothing to do with “white people” not understanding. The whole idea to change the mascot came from the district. They started the committee after years of feedback. I can understand your response to the OP yet the situation inherently deals with “white people’s” perception of the idea. I mean look to the other comments here. Many aren’t just advocating to keep the name; they outright state they don’t understand how “redmen” could even be offensive or pejorative. I am speaking from the point of view of a middle aged white man, so I cannot claim to understand all of the cultural behind this issue. However, I do wonder why one of the few groups I am aware of are against positive recognition of strength and power. No other cultural groups that I am aware of— whites, blacks, browns, etc.— have what many of us consider a great honor, recognition, and high esteem. It is true that, in the past, Redmen could have and was used in derogatory fashion, but it has become a term of honor on most cases. The meaning and connotations of words change over the years, and this term has gotten better. However, if Native Americans feel truly sensitive to this term being used the way it is at Cedar, give that recognition, honor, and high esteem to something else. Once the term Redmen is gone, however, it will not come back, so think it out carefully if that is what is desired. My parents warned me many times to be careful what I wished for. Sad that this is such a big deal in our society. I am Native American ancestry on both side of my parents lineage. My Mother could pass as Native American. I’m as white mutt as you can be. I have German, Irish, Welsh, British and probably a few other cultures mixed in. I’d be happy to have any of them represented as a Mascot. But we live in America. None of those cultures have the same heritage ownership as Native Americans. It has always seemed an honorary privilege to be a Mascot for an institute of learning in my eyes. But if it does change, how about Mountain Massacerers? Or Polygamists? Maybe Iron Miners? Thunderchicks? Oh wait, the best one Cedar City Prairie Dogs. That’s got to be it! Truth be told I graduated a Panther. (mic drop) So maybe my opinion doesn’t matter. How about we worry about something that actually matters in life? Who else, besides me, is white and married to a Native American? What commenter is Native American and married to a white person? We get along just fine. Love the Native Americans! And I didn’t steal anything from Y’All and I think you are beautiful people! what’s next are they going to protest how offensive some street names are. ? you dont see Mexico complaining about the Cleveland Browns….. I was proud to be a “Redman”, years ago but tucked my pride in and became a “sorghum lapper” years ago (Best mistake I ever made). I saw what happened to DSC when they trashed the mascot “Rebel” and tried, in vane to recreate a substitute. “Red Storm”? The name of the Russian tank corps? By 2016 DSC, now DSU, had been stripped of it’s heritage and customs and had added a mascot, Billy the Bison. Worse than that, to create a new tradition and heritage, you can see what Billy has morphed into around town, a psychedelic monstrosity. Please, if it is important to the Piute Tribe to discard the Redmen, then let it be but don’t fall into the trap set by dear old Dixie State. Don’t let an entitled few dictate the choice, even if it is contrary to the all important “Political Correctness” affliction. Struggles of cultural diversities living together. I wish we were all the big “melting pot” where cultures didn’t matter. Especially in this era of PC. But then, does the melting pot claim a special culture? No . . . I think that the Piutes should be proud of the high school Redman name for the mascots. Not many of them in the meeting opposed the name. The PC police probably started this, and now people are way too concerned about offending people. Another thing. Someone in the story said “Redman” was used by the people practicing the scalping of Native Americans for money. The real term used was “Redskins.” So the person got that mixed up. Let’s get away from the fear imposed by the PC police, and let’s be honest with one another. I don’t use the term Redman as an offensive term and neither do many of the Piutes it seems. The original people of America are what matters here and their feelings on this are what’s really important. I think the school should change it to the CHS snowflakes to represent there sensitive emotions.